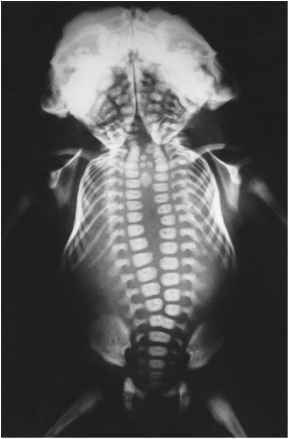 Congenital ossification defects of the calvaria are rare. Some of them, such as agenesis of entire bones of the cranial vault, are exceptional anomalies (de Heer et al. 2003). Others, such as foramina parietalia and cranium bifidum, are more common and will be discussed in this section. A miscellaneous group of syndromic disorders manifesting skull defects as one feature is also included. Craniolacunia is a peculiar type of calvarial dysplasia, which is characterized by multiple,'soap-bub-ble' areas of bone rarefactions that can give the faulty impression of abnormal calvarial openings (Fig. 1.13a,b). On the other hand, a true midline cranial defect, with or without meningo(encephalo)cele, can be an associated finding, as craniolacunia almost invariably occurs in patients with spinal or cranial dys-raphism and Arnold-Chiari malformation type II. The mechanism underlying the development of craniolacunia is only partially understood, and it is generally related to dysplastic bone formation associated with focal dural defects. Certainly, congenital hydro-cephalus has no role in this. Lacunar skull develops during fetal life, is apparent at birth, and usually disappears by the 5th month of postnatal life. In sharp contrast, the pattern of increased convolutional markings (or 'copper-beaten' appearance) associated with chronically increased intracranial pressure does not usually develop before the end of the 1st year. this syndrome, multiple exostoses, is caused by deficiency of the EXT2 gene, which is located in the same proximal chromosomal region as the ALX4 gene (Po-tocki and Shaffer 1996; Hall et al. 2001). Other occasional manifestations, including craniofacial dysos-tosis and mental retardation, are probably secondary to hemizygosity of genes located outside of the D11S1785-D11S1385 region. 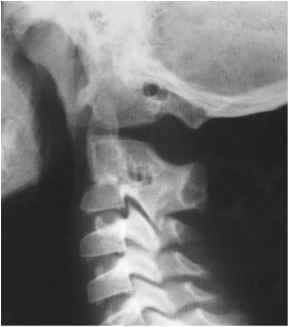 Foramina parietalia permagna occur as one feature of cleidocranial dysplasia (OMIM 168550) (Eckstein and Hoare 1963; Golabi et al. 1983) and as an occasional manifestation of Rubinstein-Taybi syndrome (OMIM 180849). A third gene locus for foramina parietalia permagna has been assigned to chromosome 4q21-q23 (Chen et al. 2003). Fig. 1.16 a, b. Encephalocele of the cranial vault in a male new- with the anterior fontanel. Observe dysplastic changes of the born. 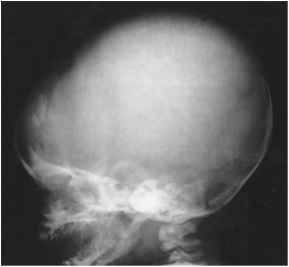 Note wide midline opening in the frontal-parietal re- frontal and parietal bones adjacent to the bone defect gion,with a large encephalocele. The bony defect is continuous ternal exposure of the brain (Hunt and Hobar 2003). Individuals with frontoethmoidal encephalocele sometimes have additional anomalies, including microcephaly (24%), microphthalmos (16%), and hydrocephalus (12 %). Mental retardation occurs in half the cases, whereas seizures are rare. Unlike sincipital encephaloceles, basal encephaloceles are not visible externally, as they are intranasal or intrasinusal lesions. The herniated brain (frontal lobes, olfactory bulbs, pituitary gland and hypothalamus, etc.) usually extends inferiorly through a defect in the cribi-form plate or floor of the sella turcica, reaching the nasal cavity or the sinuses. 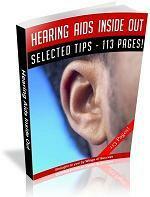 Symptoms are often misinterpreted as those of aspecific nasal obstruction, leading to frequent delay in diagnosis. Occasionally, a basal encephalocele is not detected until late adulthood, when visual disturbance, pituitary-hypothala-mus dysfunction, or CSF rhinorrhea suggests the correct diagnosis (Buchfelder et al. 1987). The presence of other signs of craniofacial dysraphism, such as cleft upper lip, optic nerve dysplasia, and callosal dysgenesis, facilitates the diagnosis. ral tube defects, is inherited as an X-linked recessive trait (Toriello et al. 1980). However, environmental factors have also been implicated, specifically a high concentration of lead in the water,which might eventually compete with intestinal absorption of folic acid (Bound et al. 1997). 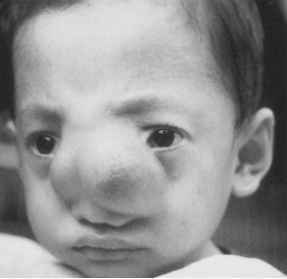 Cranium bifidum can be an isolated defect, or it can occur as one feature of aminopterin/methotrexate embryopathy, frontonasal dysplasia, fronto-facio-nasal dysplasia, and Knobloch syndrome (Terrafranca and Zellis 1953). Hereditary cranium bifidum and foramina parietalia per-magna may be different expressions, possibly age related, of the same defect (Little et al. 1990). Indeed, progression has been demonstrated from cranium bifidum during early childhood to symmetrical parietal foramina during the middle years of childhood and adulthood (Murphy and Gooding 1970). Frontonasal dysplasia (median facial cleft syndrome, OMIM 136760) includes a constellation of features, such as cranium bifidum occultum frontalis (Fig. 1.19), widow's peak hairline, ocular hypertelorism, and variable nasal defects, ranging in severity from a broad nasal root with lacking nasal tip to wide separation of the nares with absent prolabium and median cleft lip (Sedano et al. 1970). Nasal skin tags are occasionally present. Nearly all reported cases have been sporadic, with no evidence for a genetic basis (Sedano et al. 1970). Only a few familial cases have been reported (Naidich et al. 1988; Cohen et al. 1971; Warkany et al. 1973). Occasional associated abnormalities include congenital heart defects, notably tetralogy of Fallot (de Moor et al. 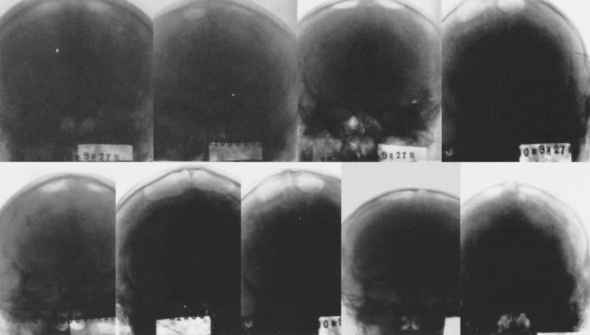 1987), various skeletal defects, mental deficiency (Prescott et al. 1989), agenesis of corpus callosum with or without lipoma (Nevin et al. 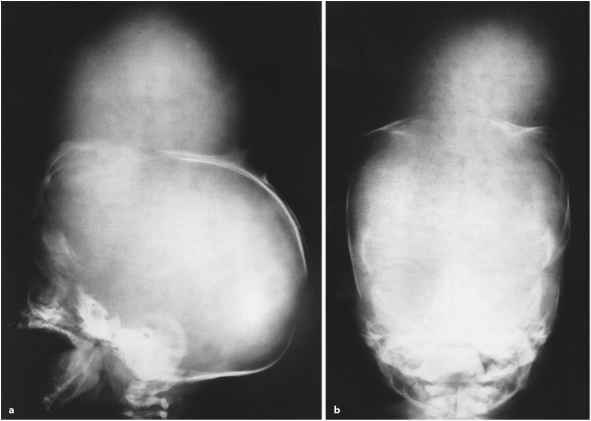 1999), and anterior basal en-cephalocele (Grubben et al. 1990). Fronto-facio-nasal dysostosis (fronto-facio-nasal dysplasia, OMIM 229400) includes brachycephaly, cranium bifidum with or without encephalocele, ocular anomalies (blepharophimosis, ptosis, lagophthalmos, dermoid of the eye, colobomata of the iris), bilateral cleft lip and palate, deformed nostrils, hypertelorism, and severe midface hypoplasia (Gollop 1981; White et al. 1991). Inheritance is probably autosomal recessive (Gollop et al. 1984). Knobloch syndrome (OMIM 267750) is characterized by severe myopia,vitreoreti-nal degeneration with retinal detachment, and occipital cephalocele (Knobloch and Layer 1971). Occasionally, the cranial defect involves the frontal rather than the occipital bones (Snider et al. 2000). Intelligence is not affected, suggesting that a meningocele rather than an encephalocele is involved in most cases (Cohen and Lemire 1982). Considerable intra- and interfamilial variability has been reported (Klie-mann et al. 2003). This syndrome is caused by a mutation in the COL18A1 gene on chromosome 21q22.3 (Sertie et al. 2000) and is inherited as an autosomal recessive trait (Passos-Bueno et al. 1994). Meckel syndrome (Meckel-Gruber syndrome, OMIM 249000) is an autosomal recessive disorder characterized by renal cysts, posterior encephalocele, and polydactyly (Fraser and Lytwyn 1981). Hepatic fibrosis and various developmental anomalies of the central nervous system, notably Dandy-Walker malformation, are additional features (Al-Gazali et al. 1996). The disorder is clinically and genetically heterogeneous, and minimal diagnostic criteria are difficult to define (Seller 1975). Similarities with trisomy 13 are striking, although occipital encephalocele is not a feature of chromosome 13 aneuploidy (Hsia et al. 1971).One locus for Meckel syndrome, MKS1 , has been mapped to 17q21-q24 (Paavola et al. 1995). Additional loci, MKS2 (OMIM 603194) and MKS3 (OMIM 607361), have been assigned to 11q13 (Roume et al. 1998) and 8q24 (Morgan et al. 2002). 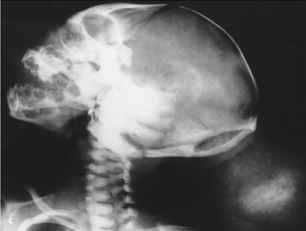 Syndromic Disorders with Skull Defects. Aplasia cutis congenita (congenital defect of skull and scalp, OMIM 107600) is an autosomal dominant disorder characterized by a localized area of defective skin in the scalp (sometimes in the trunk or extremities) and in the underlying calvaria (Cutlip et al. 1967; Deeken and Caplan 1970; Fullana et al. 1995). An autosomal recessive form of aplasia cutis congenita (OMIM 207700) has been suggested (Gedda et al. 1963; Dubosson and Schneider 1978). All skin layers and subcutaneous tissue are either absent, thus exposing the dura mater and deeper meninges, or extremely hypoplastic, appearing as thin transparent membranes. Congenital heart disease, notably ventricular septal defect and valvular pulmonary steno-sis,have been reported (David et al. 1991; Fryns et al. 1992). 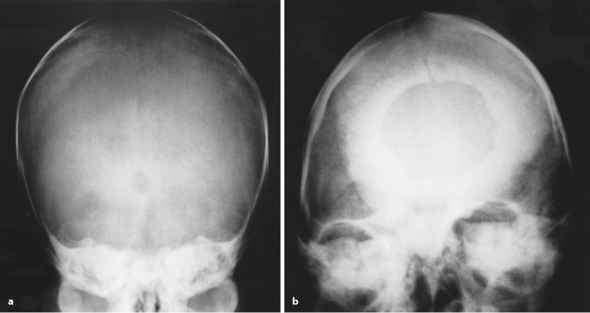 Occasional associated malformations include macrocephaly and wide, high forehead (Fryns et al. 1992). A defect in the scalp occasionally occurs in trisomy 13, Wolf-Hirschhorn syndrome (OMIM 194190), and Johanson-Blizzard syndrome (OMIM 243800). Adams-Oliver syndrome (congenital scalp defects with distal limb reduction anomalies, OMIM 100300) encompasses terminal transverse defects of the limbs, and scalp/skull defects similar to those of aplasia cutis congenita (Adams and Oliver 1945). This is a genetically heterogeneous disorder, in which instances of autosomal dominant (Bonafede and Beighton 1979) and recessive (Koiffmann et al. 1988) inheritance, and also sporadic cases (Kuster et al. 1988), have been reported. The limb defects range in severity from shortening of phalanges to absence of entire portions of the limbs. 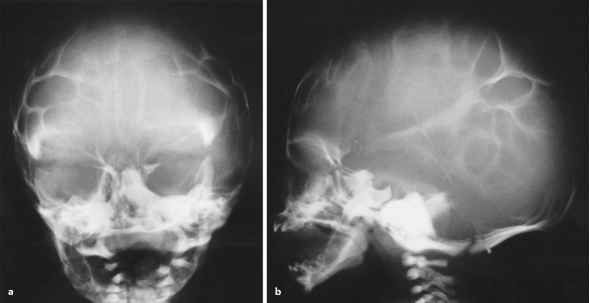 Skull defects occur in about 21 % of cases and may be so large as to imply complete absence of the calvarial bones, or even acra-nia (Farrell et al. 1993; Chitayat et al. 1992). Based on the evidence that vascular skin anomalies such as cutis marmorata telangiectatica and dilated scalp veins are common in Adams-Oliver syndrome (To-riello et al. 1988; Pereira-da-Silva et al. 2000), it has been suggested that this disorder results from a vascular disruption sequence (der Kaloustian et al. 1991; Keymolen et al. 1999). What parts of the brain are affected by down syndrome? What is a calvarial defect? What is calvarial deformity with multiple osseous defects? What is calvaria in newborn?